An initiative to encourage more girls to cycle to school in Scotland is proving a success, with evaluation showing the number has almost tripled among participating schools. Funded by the Scottish Government and delivered through Sustrans Scotland, ‘I Bike’ aims to reduce the gender gap which currently sees more boys cycling to school than girls. Since 2009, I Bike has worked with 375 schools across Scotland, engaging with more than 75,000 pupils. It has carried out more than 6,200 activities aimed at girls in the past three years alone. 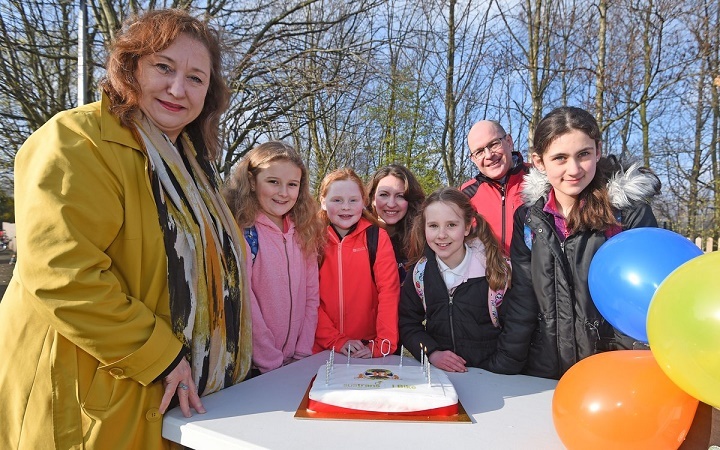 Evaluation published to mark the scheme’s 10th birthday (pictured) shows 7.9% of girls in participating schools cycled to school in 2018 – compared to 2.8% in 2008. Across both genders, 7.1% of pupils at I Bike schools travel by bike, nearly double the national average of 3.7%. Lynn Stocks, Sustrans Scotland head of behaviour change, said: “We’re really proud of the role I Bike has played in schools across Scotland in creating a walking and cycling culture with parents, teachers and pupils. Lee Craigie, active nation commissioner for Scotland, said: “For the past 10 years, I Bike has been inspiring young people, and particularly young girls, to get on their bike and live a more active life.